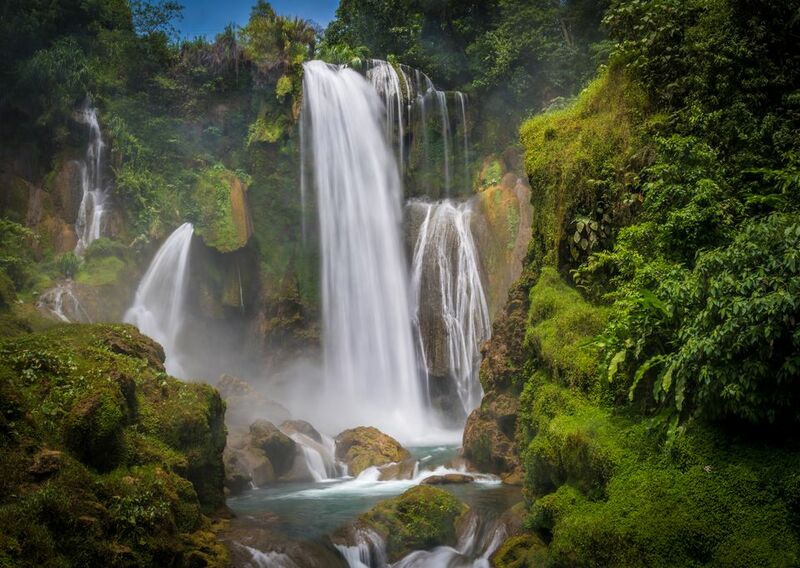 Honduras weather is considered tropical on both its Pacific and Caribbean coasts, though the climate tends to be more temperate inland, especially in the mountains. The Bay Islands are still another story, with a subtropical climate. The Caribbean is on the north side of Honduras, with the Pacific Ocean touching just a small bit of coastline on the south. It has 416 miles of shoreline on the Caribbean coast, with lowlands running along the Pacific. Mountains run through the center of the country, with the highest peak, Cerro Las Minas, topping out at 9,416 feet. The Bay Islands in the Caribbean are part of the Mesoamerican Barrier Reef, a famous diver's paradise that stretches 600 miles from Mexico to Honduras. The weather in Honduras is strikingly different depending on location. The north coast is hot and wets most of the year, rainy season or not. The rainy season is from May to October in this region, and it is seriously wet. Rock slides, mudslides, and flooding are all possible, and those don't make for a fun vacation. Smart travelers avoid being there during this time and make plans to visit during the dry season, from November to April. The Bay Islands' rainy season is from July through January, with it getting progressively wetter from October through January. The southern Pacific coast is dry a lot of time, but also hot. The entire country is hot most of the time. Average high temperatures range from about 82 degrees Fahrenheit in December and January to nearly 87 degrees in August. And it never gets very cold at night: Average lows in January and February hover around 71 degrees, with that temperature around 76 from May through August. In the mountains, you can expect the temperatures to be slightly lower, as well as on the Bay Islands. All this dependable warmth is what makes Honduras a prime wintertime destination for those in colder climates; wintertime is also the dry season, so it's the right time to travel to Honduras. Hurricane season in the Caribbean is from June to November. Honduras and its Bay Islands lie a bit off the path of the hurricanes generally, but the country can feel the impact of the edges of hurricanes and tropical storms. Hurricanes are a possibility on Honduras from June through November, but August through October are the most likely months. These storms usually arise out of the Caribbean Sea, to the east, but can occasionally develop as tropical depressions on the Pacific Ocean. Hurricanes Fifi (Sept. 1974) and Mitch (Oct. 1998) were particularly destructive in the country. Spring in Honduras is quite warm and dry, especially along the country's northeast and southern coasts. Temperatures typically range from the high 70s to the low 90s through March and April but warm up a bit in May, which also marks the kickoff of Honduras' rainy season. What to Pack: Pack light clothing, including a sweatshirt or sweater for the evenings. If you're visiting in May, bring an umbrella or raincoat. Heavy rain and thunderstorms occur during summer in the central and western parts of the country. In Tegucigalpa, it's not uncommon to have more than 25 days of rain! Temperatures are still warm, but this time of year is also extremely humid, especially in June. What to Pack: Take lightweight, breathable clothing made of cotton or linen to stay comfortable in the Honduras heat. Take along an umbrella; a hooded, thin trench coat or poncho, too, for summer's heavy rains. September cools down a bit, but humidity (and precipitation) are still high. October is similar, with severe thunderstorms sometimes occurring more than 15 days out of the month. In November, you can find great weather along the Pacific Coast, where it's sunny and dry. What to Pack: Pack traditional tropics-friendly clothing, plus a light sweatshirt or light raincoat for thunderstorms. If you're hiking or going up into the mountains, you'll need warmer layers and waterproof shoes. What to Pack: Take lightweight clothing and cool and comfortable shoes—sandals, tennis shoes and canvas espadrilles are good choices. And, of course, your favorite swimwear and cover-up.